Half of community and technical college students struggle with food insecurity. A national survey conducted by University of Wisconsin researchers found that between 42% and 56% of community college students reported being food insecure in the last 30 days. For two hours each week, the mobile food banks provide food to people in need at each site. In the eight weeks since we launched the first college site at TCC, we have served food to 672 people from these new distribution locations. While the mobile food banks are located on campus, they are open to anyone in need. Many of the campuses are located in neighborhoods with limited food options, so the new mobile food bank sites are a help to college students as well as the community members living nearby. Nourish’s mobile food banks are full-service food banks on wheels. They provide clients with the same amount of food as if they visited one of our fixed location food banks and they use the same self-select service model. 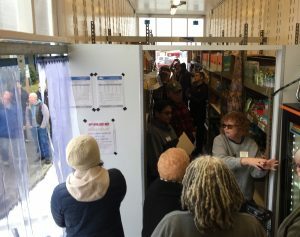 Nourish currently has seventeen mobile food bank sites around Pierce County. To find the hours of operation, visit our Food Bank Locations page. Support Nourish’s ability to provide this service, make a donation today.